The allure of the multi-cultural capital, Brussels, stems from its mix of political intrigue, artistic influence, historical significance, and a thriving social scene. 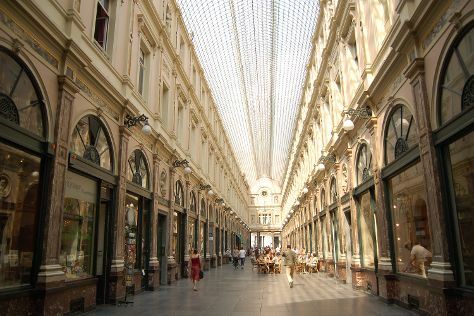 Get some cultural insight at Les Galeries Royales Saint-Hubert and Grand Place. Get some historical perspective at St. Michael and St. Gudula Cathedral (Cathedrale St-Michel et Ste-Gudule) and Royal Palace of Brussels. You'll find plenty of places to visit near Brussels: Antwerp (Grote Markt van Antwerpen, Sint-Annastrand, & more). There's still lots to do: see the interesting displays at Atomium, explore the world behind art at René Magritte Museum, appreciate the history behind Manneken Pis, and take a stroll through Place St. Gery. For photos, reviews, traveler tips, and more tourist information, read our Brussels road trip planning website . Chandigarh, India to Brussels is an approximately 14-hour flight. You can also do a combination of flight and train; or do a combination of flight and shuttle. The time zone difference moving from India Standard Time to Central European Time is minus 4 hours. In October, plan for daily highs up to 16°C, and evening lows to 9°C. Wrap up your sightseeing on the 9th (Fri) to allow time to drive to Bruges. 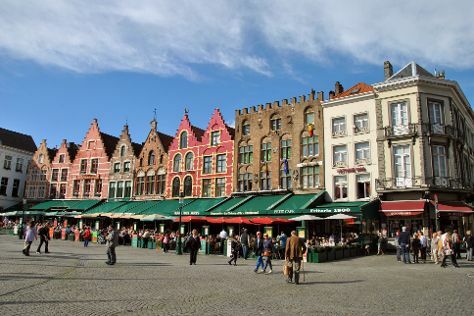 Popular historic sites such as Historic Centre of Brugge and Church of Our Lady Bruges are in your itinerary. Get a sense of the local culture at Basilica of the Holy Blood and Belfry of Bruges. Explore the numerous day-trip ideas around Bruges: Ghent (Saint Bavo's Cathedral, DOK City Beach, & more), Naaaktstrand Bredene (in Bredene) and De Panne Beach (in De Panne). There's much more to do: sample the tasty concoctions at De Halve Maan Brewery, get to know the fascinating history of Beguinage (Begijnhof), see the interesting displays at Friet Museum, and look for gifts at The Old Chocolate House. For traveler tips, other places to visit, and tourist information, use the Bruges trip website . Traveling by car from Brussels to Bruges takes 1.5 hours. Alternatively, you can take a train. In November in Bruges, expect temperatures between 12°C during the day and 5°C at night. Finish your sightseeing early on the 17th (Sat) so you can drive to Dinant. Located along the Upper Meuse Valley, the city of Dinant features colorful buildings framing its famous church and a clifftop citadel in the background. Get some cultural insight at Chateau de Bouillon and Mardasson Memorial. Get some historical perspective at Old Town of Durbuy and Citadelle (Citadel). Venture out of the city with trips to European Flight Simulator (in Gosselies), Abbaye d'Orval (in Florenvill) and The Domain of the Caves of Han (in Han-sur-Lesse). To find more things to do, traveler tips, and tourist information, you can read our Dinant holiday planning site . You can drive from Bruges to Dinant in 2.5 hours. Alternatively, you can take a train; or take a train. In November, plan for daily highs up to 9°C, and evening lows to 3°C. Cap off your sightseeing on the 20th (Tue) early enough to travel back home.